The OPC Foundation is a global automation organization having close links with PI. For example, the FDI (Field Device Integration) initiative in which PI plays a leading role utilises the advanced features of the Unified Architecture (UA) technology of OPC. 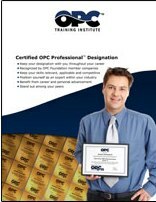 OPCTI offers excellent practical OPC training leading to Certified OPC Professional (COP) accreditation. They’ve arranged a full week of training in London from 25 to 29 November with special discount terms for members of The PROFIBUS Group. Contact us now for details of the special discounts. The courses follow a modular format designed to enable students to attain full familiarity with the contents both in theory and in practice. There are four levels of attainment covering the full range of OPC capabilities. All four levels will be delivered in the Accelerated OPC Workshop format which is ideal for people who need to learn about OPC but have time and budget constraints. Students cover the 4 distinct courses detailed below in a shortened time-frame of 1 week. Students learn the OPC Unified Architecture (OPC UA) set of specifications. The hands-on class covers the security model that enhances Classic OPC capabilities. Students explore OPC UA’s data information model and data transportation, which now use Web Services and binary protocols to eliminate reliance on Microsoft’s DCOM technology. Taking place in November in London the week of 25th November, each module costs £1495. Discounted pricing is available to students taking all four modules in the Accelerated Workshop format or for companies sending 3 or more people to the same module. There are also special discounts for members of the UK PROFIBUS Group. Contact us now on +44 207 193 8018 or email us to register your interest or request further information.